Juvenile firesetting is a complex and dangerous problem. 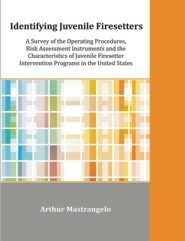 According to the National Fire Protection Association (NFPA) between 2005 and 2009 juvenile firesetters were responsible on average for 56,300 fires annually and, according to the Federal Bureau of Investigation, over the past twenty years more than half of juvenile arrests have been for arson. The Federal Emergency Management Agency's (FEMA) Juvenile Firesetter Intervention Handbook provides risk assessment tools to assess future firesetting involvement. The fire service, because of its role in fire suppression and investigation, is often the initial contact for these juveniles. This study examined the characteristics, operations, and utility of the Handbook's assessment instruments. Findings were that while programs operate according to FEMA’s guidelines, fewer than half utilized FEMA's assessment instruments. Policy and regulation for third sector broadcasting: what can be learned from the Australian and Canadian experiences?